These Vegan Black Bean and Quinoa Veggie Burgers are really easy to make and are a much better alternative to store-bought veggie burgers. I’ve had homemade veggie burgers on my “to do” list for a very long time and it wasn’t until a Facebook reader asked if I had a recipe did I finally decide it was time to do it. I must have 5 – 6 different recipes saved from over the years and although I’ll get around to trying them all, I decided this would be the first one I’d try. The reason being is probably because it has two of my favorite ingredients – black beans and quinoa. The creator of the recipe, Sonali at The Foodie Physician, gives a really good explanation of how she came up with the perfect combination of ingredients for this recipe on her website. But since I’m famous for taking “short-cuts” when making recipes, I made the lazy version (just put everything in a bowl and stir), and it still came out very nicely. Another thing I’m pretty proud of is that I tackled another thing on my “to do” list and that was to make homemade vegan hamburger buns. Yes, I did! 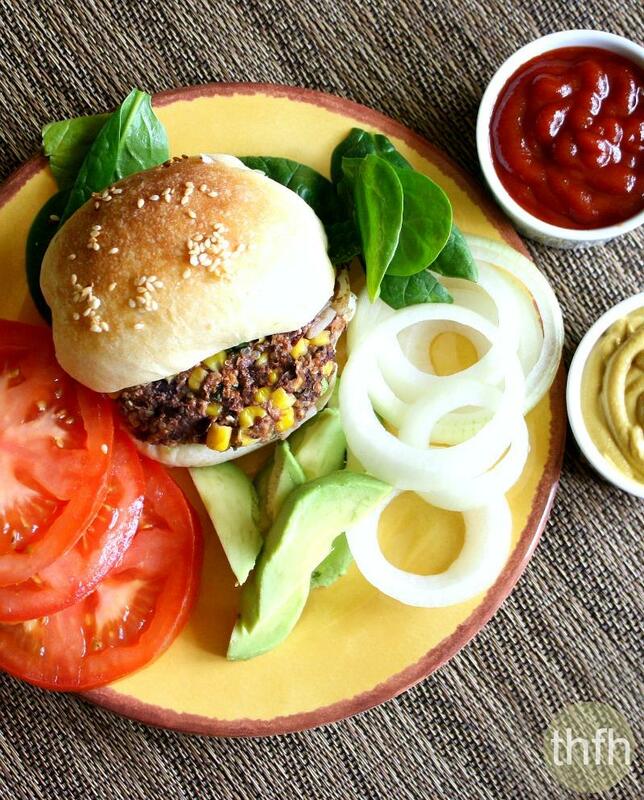 So here’s an easy homemade veggie burger recipe with a homemade vegan bun recipe to follow that has lots of healthy vegan protein from the black beans and quinoa. Store-bought veggie burgers might be a little more convenient and time saving, but at what cost? They contain lots of GMO ingredients like corn, corn oil, corn starch, corn protein hydrolyzed, soy protein hydrolyzed as well as other highly processed ingredients like caramel color and natural and artificial flavors, and wheat and egg whites making them not suitable for those following a gluten-free or vegan diet. This healthier version is made with clean, real ingredients and they’re vegan, gluten-free, dairy-free and egg-free. Want more healthy dinner and meal recipes? Check out Kelp Noodles with Spicy Peanut Sauce, Vegan Stuffed Pepper Soup, Spaghetti Squash with Creamy Lemon Garlic Sauce or my Clean Eating eCookbook with an entire chapter of 20 healthy, clean eating meal and entree recipes that you will love! Note #1: The original recipe gave two options for cooking them: oven or on the griddle. I used the oven option and they were fine, but you just need to make sure they are cooked until they are nice and crispy – very important. Otherwise they will be a little limp and fall apart. Note #2: I didn’t refrigerate mine for a couple of hours or overnight as directed in the original recipe, and they were fine. Note #3: I didn’t freeze mine so I don’t know if they will freeze well, but the original recipe says they can be frozen individually so that’s good to know. Note #4: Next time I make them, I will probably increase the seasonings/spices just a little bit, so start with the recipe amounts and adjust accordingly to your taste. Step 1 Prepare quinoa according to package directions. 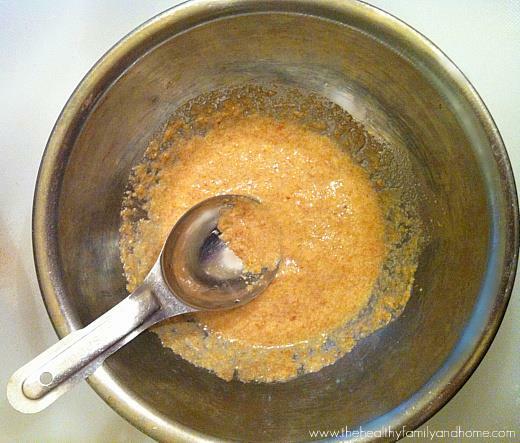 Prepare flax egg by mixing 1 tablespoon of ground flax seeds + 3 tablespoons of water. Mash the black beans with a fork or potato masher until a pasty mixture forms. 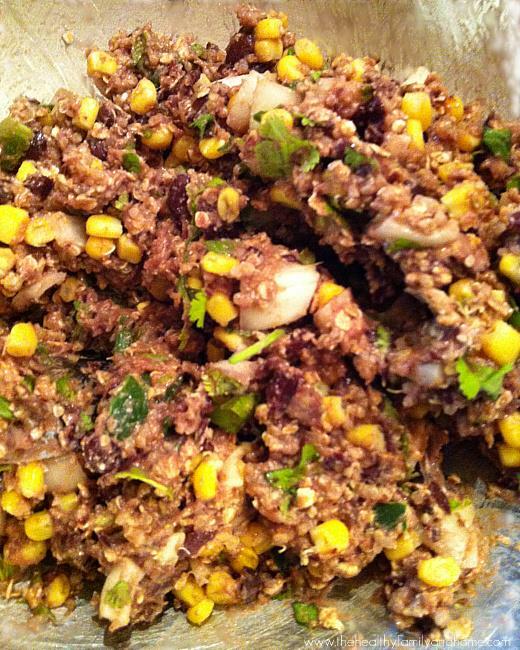 Mix cooked quinoa, flax egg, mashed black beans and all other ingredients into a large mixing bowl and stir until well combined. 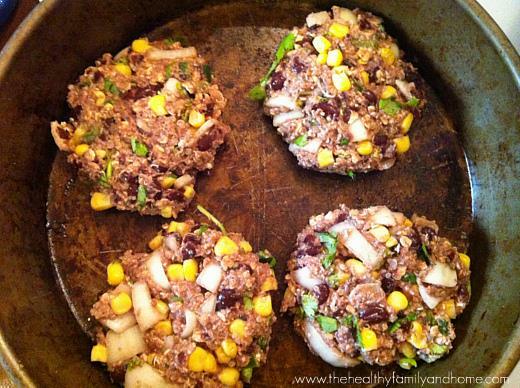 Form the mixture into 6 equal patties, compacting them well with your hands as you form them. Cook in oven at 400 degrees for 10 - 12 minutes then flip over and cook the other side for an additional 10 - 12 minutes or until golden brown and crispy. 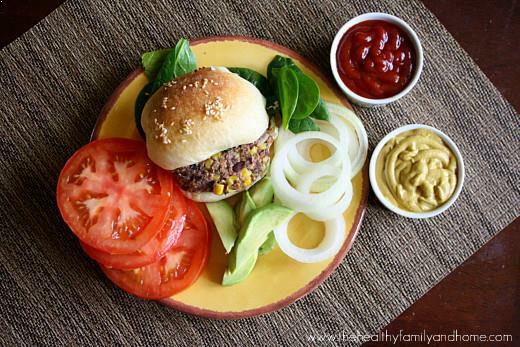 Serve with your favorite veggie burger toppings. The photographs for "Vegan Black Bean and Quinoa Veggie Burgers" by Karielyn Tillman of The Healthy Family and Home are licensed under a Creative Commons Attribution-NonCommercial 4.0 International License and cannot be used without my written permission. Hi there Alisha! It should make (8) burgers. This looks great! I’ve cleaned out my cupboards and set myself a ‘pantry challenge’ to use everything up before buying more store cupboard foods. This looks like a great way to make a dent in my mountain of quinoa. Hi Kate! Very good for doing a pantry clean out! 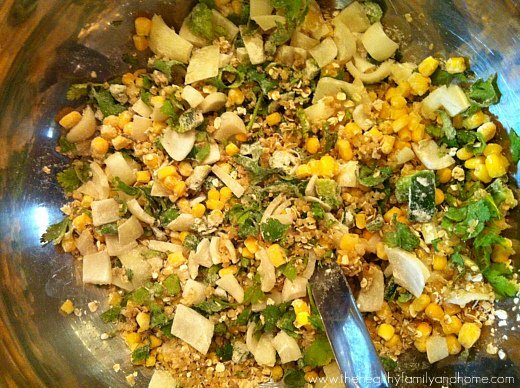 I have so many quinoa recipes in my “to-make” list I sometime feel like I’ll never make them all lol! This recipe was sooo good! My husband and I both loved it and will definitely be making them again! Hi Kayla! I am so glad to hear you enjoyed them! And to get husband approval is even better because I know how hard it can be to try a new recipe out on a husband lol! Hey, Thanks for the recipe! The Veggie Burger was delicious! Good food to keep a healthy body. 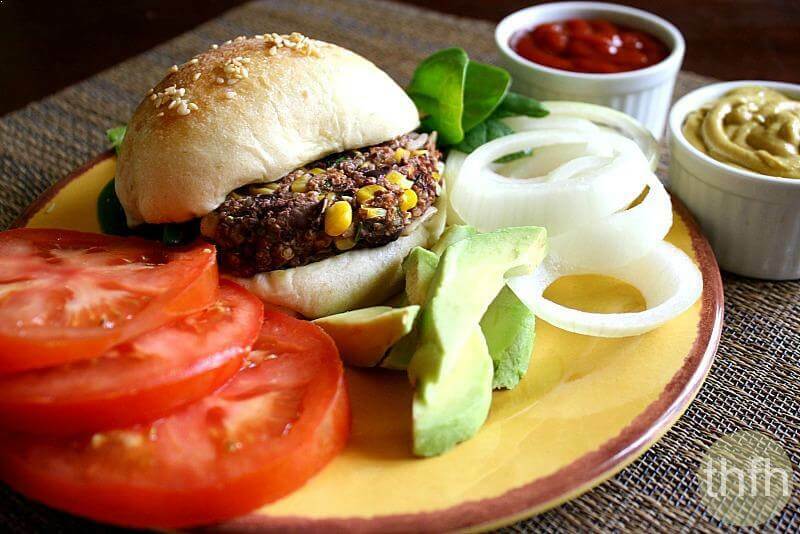 The vegan quinoa and black bean burger was delicious and we will make this a regular in our menu plan. I substituted a mesquite seasoning for the cumin and it gave it that grilled flavor. Served with oven fries and sliced avocados and cucumbers. Yummm! Hi Tracey! I love the things you served on the side and the mesquite seasoning! I’ve never used that before but it’s a great idea and I might try it next time since I wanted to increase the seasonings a little the next time I make them.